Self-tanner is considered by many to be one of the most polarizing beauty products — but it doesn’t have to be. Take it from Tan-Luxe® founder, Marc Elrick, who says he was “scared” to use the stuff for years before he launched the brand. “I've had every tanning disaster you can think of,” he shares; “streaks, orange [color], dried-on clumps, [darkened] pores.” As many of us know from first-hand experience, such mishaps are not unique to Elrick. But when applied correctly, he swears self-tanner has physical and emotional benefits (really!) that far outweigh the risks. Below, the pro shares his secrets for creating an even glow — even if you’re brand new to bronzing. While it may sound obvious, choosing a formula that is simply too deep for your particular skin tone may result in a mishap (and make you swear off self-tanner for good!). Consider tanner as you would foundation: it’s not one-shade-fits all. For the most believable results, Elrick advises opting for a formula that makes sense for your coloring. “If you burn in the sun, always opt for a light to medium formula,” he suggests. Try Tan-Luxe The Water in Light to Medium ($50), a clear, quick-drying self-tanner. On the other hand, if your complexion veers olive or deeper, a more intense formula (such as St. Tropez Self Tan Extra Dark Bronzing Mousse, $45) will still end up looking natural. Elrick’s motto: "You don't choose the tan. The tan chooses you." There are few things more disheartening — and less natural-looking — than a splotchy tan. Avoid the issue by exfoliating your body before application (flaky and/or dry skin could cause unevenness). We like using Harper + Ari® Exfoliating Sugar Cubes in Rosé ($23) for this — the single-serving scrub cubes are simple to use and look chic tubside. Additionally, hydrating your skin will go a long way towards achieving an even glow. “If you have excessively dry skin or dry patches, moisturize your hands, elbows, and feet,” Elrick says. He loves applying an oil-rich body butter to these areas; these formulas can create a barrier on the skin and mitigate the risk of product overload in dry spots. 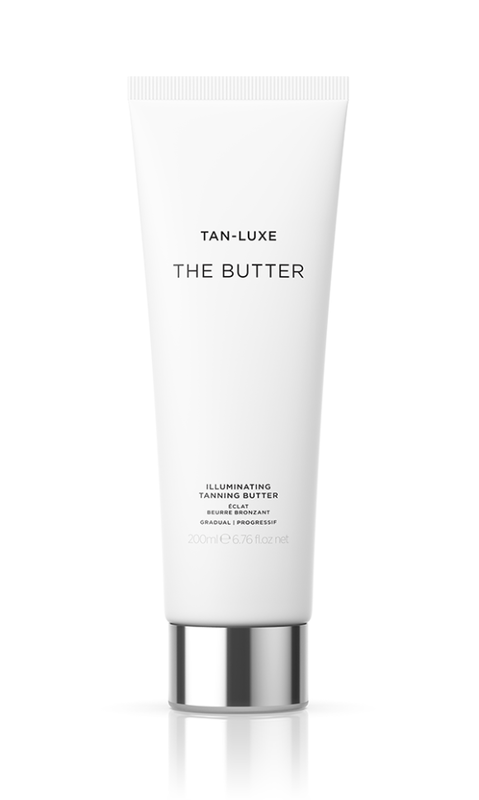 You can also use a ultra-nourishing tanning formula like Elrick’s own Tan-Luxe The Butter ($37). This product was formulated with coconut oil, shea butter, and cocoa butter to deliver a dose of moisture as it bronzes. Repeat after us: “I will not use my hands to apply self-tanner.” Instead, use a tanning mitt (such as St. Tropez Applicator $7) on the entire body in large, circular motions. For hard-to-reach spots like the hands, Elrick recommends using a makeup brush or a beautyblender® ($20) to apply the product after you’ve finished with your limbs. Remember: self-tanner usually takes a few hours to develop. Most formulas advise waiting for at least four hours post-application to shower. When you do take a rinse, be sure not to scrub too hard with a loofah. Not to mention, everyone — of all skin tones and genders — can benefit from the endorphin-boosting effects of a little glow. “[Men] forget that a little bit of concealer or couple boxes of self tan can really impart an effect on self esteem,” Elrick says. We can’t say we’d disagree!